The March 31 “Revolution for Truth” rally in Washington, DC, sponsored by World Mercury Project and four other organizations. The 317 Coalition: The 317 Coalition derives its name from Section 317 of the Public Health Service Act, which authorizes federal purchases of vaccines. The 317 Coalition’s organizational members include vaccine manufacturers. 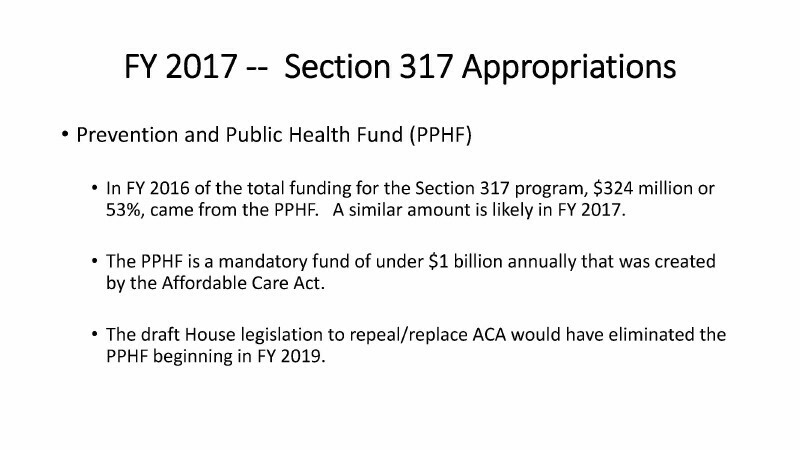 The Coalition’s “sole” focus is advocacy for increased Section 317 funding. Federal vaccine purchases currently depend on the Affordable Care Act (ACA) for over half of their funds, giving rise to Coalition worries about what might happen with an ACA modification or repeal (Figure 2). The 317 Coalition is staffed by Cornerstone Government Affairs—a PR firm based in Washington, DC, that specializes in “federal and state government relations” and “strategic communications.” Mark Mioduski, one of Cornerstone’s senior founding partners, presented webinar content on behalf of the Coalition. 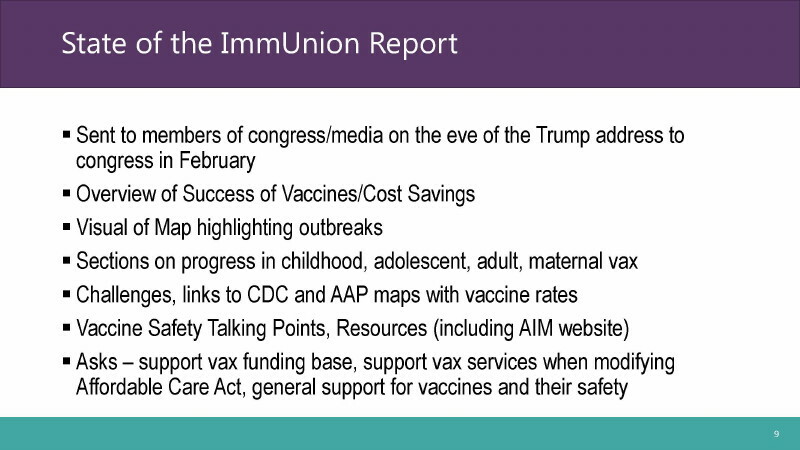 Every Child by Two (ECBT): ECBT works to “share [the] value of vaccines with federal and state legislators” and generate vaccine safety “talking points” (Figure 3). The webinar presenter, Amy Pisani, is ECBT’s Executive Director. The Adult Vaccine Access Coalition (AVAC): AVAC focuses on “bringing necessary federal policy changes” to increase adult vaccination rates, in particular. The webinar presenter, Abby Bownas (employed by another Washington, DC-based PR company called NVG LLC), routinely lobbies policymakers in support of “legislative and regulatory solutions” to get more adults to line up for vaccines. There are many overlapping connections between these (and similar) organizations. For example, ECBT’s Amy Pisani serves on the 317 Coalition’s six-member Steering Committee and on Paul Offit’s Vaccine Education Center Advisory Board. Offit, in turn, sits on the ECBT Board of Directors as well as the 317 Coalition Steering Committee. The IAC’s Executive Director and Chief Strategy Officer are two of the remaining members of the 317 Coalition Steering Committee. Vaccine proponents have handily coined a new term to describe virtually anyone who raises any questions about vaccine safety (or effectiveness). The term—which contrasts with the vaccine complacency that holds sway in public health and medical circles—is vaccine hesitancy. A highly visible vaccine hesitancy article published in Pediatrics in 2016 defined the term and sought to enhance health providers’ persuasive tactics against the growing pushback from worried families. Perhaps the stellar reputation of Robert F. Kennedy, Jr. in fighting for underdogs is making it tougher for these vaccine apologists to make a smear campaign stick. 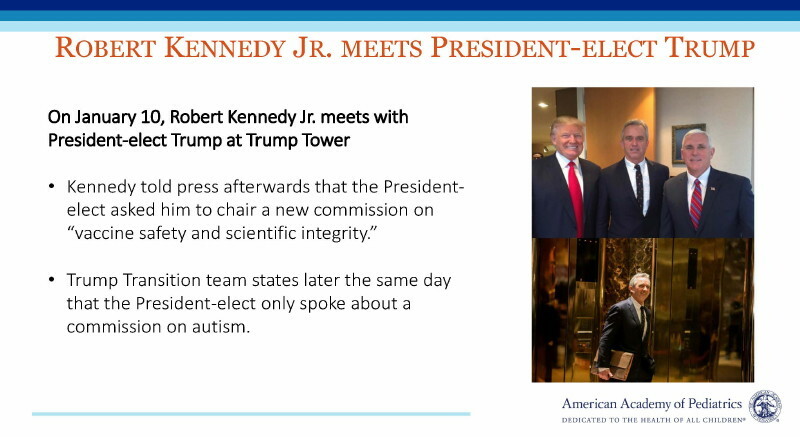 That same IAC announcement also used “Robert Kennedy Jr.’s claims about a new vaccine safety commission” as a sound bite to spur webinar attendance and marshal the troops. Even though there are other nonprofits that have long advocated for a deeper look at vaccine safety, the disproportionate attention to the relatively new-on-the-scene World Mercury Project from the IAC, AAP and other members of the vaccine juggernaut is telling. Perhaps the stellar reputation of Robert F. Kennedy, Jr. in fighting for underdogs is making it tougher for these vaccine apologists to make a smear campaign stick. Regardless, members of the public should be asking themselves where the true conflicts of interest lie. In Part Two, World Mercury Project further explores the glaring conflicts of interest that characterize the AAP and its colleague organizations. Click on link or image (below) to read this article. POTS – An Emerging Teen Disease or Post Gardasil Adverse Reaction?